Henry Shelton. [Source: US Military]National Security Adviser Sandy Berger and Secretary of State Madeleine Albright repeatedly seek consideration of a “boots on the ground” option to kill bin Laden, using the elite Delta Force. Clinton also supports the idea, telling Joint Chiefs of Staff Chairman Henry Shelton, “You know, it would scare the sh_t out of al-Qaeda if suddenly a bunch of black ninjas rappelled out of helicopters into the middle of their camp.” However, Shelton says he wants “nothing to do” with such an idea. He calls it naive, and ridicules it as “going Hollywood.” He says he would need a large force, not just a small team. [Washington Post, 12/19/2001] Counterterrorism “tsar” Richard Clarke similiarly recalls Clinton saying to Shelton “in my earshot, ‘I think we ought to have US commandos go into Afghanistan, US military units, black ninjas jumping out of helicopters, and go after al-Qaeda in Afghanistan.’ And Shelton said: ‘Whoa! I don’t think we can do that. 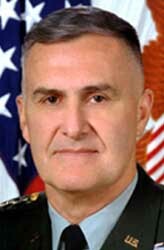 I’ll talk to Central Command.’ And of course Central Command came back and said, ‘Oh no, that’s too difficult.’” [PBS Frontline, 6/20/2006] US Central Command chief General Anthony Zinni is considered the chief opponent to the “boots on the ground” idea. [Washington Post, 10/2/2002] Clinton orders “formal planning for a mission to capture the al-Qaeda leadership.” Reports are contradictory, but some claim Clinton was told such plans were drawn up when in fact they were not. [Time, 8/12/2002; Washington Post, 10/2/2002] In any event, no such plans are implemented. On January 6, 2000, the CIA station in Malaysia begins passing details from the Malaysian government’s surveillance of the al-Qaeda summit in Kuala Lumpur, Malaysia, to the CIA Counterterrorist Center (CTC) (see January 5-8, 2000 and January 5-8, 2000 and Shortly After). Cofer Black, head of the CTC, orders that he be continually informed about the meeting. CIA Director George Tenet is frequently informed as well. They are given continual updates until the meeting ends on January 8. [Stern, 8/13/2003] National Security Adviser Sandy Berger, FBI Director Louis Freeh, and other top officials are briefed, but apparently President Clinton is not. [Bamford, 2004, pp. 225-26] However, it appears that the CIA deliberately and repeatedly fails to tell the FBI that one attendee, future 9/11 hijacker Khalid Almihdhar, has an active visa to visit the US (see Mid-July 2004, January 6, 2000, and January 5-6, 2000). No evidence will be presented suggesting anyone else outside the CIA is told this crucial fact either. The Malaysia summit ends on January 8. [9/11 Commission, 7/24/2004, pp. 237] Officially, the CIA will later claim to have lost future hijackers Alhazmi and Almihdhar as they left the meeting (see January 8, 2000). However, Almihdhar will later report back to al-Qaeda that he thought he was followed to the US (see Mid-July 2000). It will not be reported whether any of the other attendees are monitored after leaving the meeting. Shortly after the USS Cole bombing (see October 12, 2000), the US supposedly obtains intelligence that prompts President Clinton to consider another missile strike on bin Laden. The US presidential election is in early November. Author Lawrence Wright will later write, “Clinton maintains that, despite the awkward political timing, his administration came close to launching another missile attack… but at the last minute the CIA recommended calling it off because [bin Laden’s] presence at the site was not completely certain.” [Wright, 2006, pp. 244] Additionally, the tie between the Cole bombing and al-Qaeda had not yet been confirmed. The first strong evidence of such a tie will come in late November 2000 when details of an al-Qaeda operative’s confession are given to the FBI (see Late October-Late November 2000). The 9/11 Commission will make no mention of any planned strikes around this time in their final report while discussing the missed opportunities to strike at bin Laden. [9/11 Commission, 7/24/2004, pp. 237] However, the Washington Post will detail the opportunity, saying the target was a “stone compound, built around a central courtyard full of al-Qaeda operatives.” But the strike is canceled when CIA Director George Tenet calls National Security Adviser Sandy Berger and says about the quality of intelligence, “We just don’t have it.” [Washington Post, 12/19/2001] Ironically, it appears bin Laden was actually hoping to be attacked, anticipating that it would boost his reputation in the Muslim world. In the summer of 2001, the NSA will monitor two al-Qaeda operatives discussing how disappointed they are that the US did not retaliate after the Cole bombing (see June 30-July 1, 2001). Richard Clarke, counterterrorism “tsar” for the Clinton administration, briefs National Security Adviser Rice and her deputy, Steve Hadley, about al-Qaeda. [Washington Post, 1/20/2002] Outgoing National Security Adviser Sandy Berger makes an unusual appearance at the start of the meeting, saying to Rice, “I’m coming to this briefing to underscore how important I think this subject is.” He claims that he tells Rice during the transition between administrations, “I believe that the Bush administration will spend more time on terrorism generally, and on al-Qaeda specifically, than any other subject.” Clarke presents his plan to “roll back” al-Qaeda that he had given to the outgoing Clinton administration a couple of weeks earlier. [Time, 8/12/2002] He gets the impression that Rice has never heard the term al-Qaeda before. [Clarke, 2004, pp. 227-30; Guardian, 3/25/2004] Clarke is told at the meeting that he will keep his job but the position is being downgraded and he will no longer have direct access to the president (see January 3, 2001). Sandy Berger, a former national security adviser to Bill Clinton, takes notes he has made on classified documents at the National Archives out of the archives. As the papers on which the notes are based are classified, the notes are also classified, even though they are about documents Berger saw during his time as national security adviser. Berger is at the archives to prepare for an interview with the 9/11 Commission, but he had previously visited them to prepare for discussions with the 9/11 Congressional Inquiry (see May 30, 2002). As the proper security procedures are not followed, Berger is able to create a distraction and remove the top fifteen pages of the notes, leaving only two pages. [Shenon, 2008, pp. 6-7] Berger will later steal copies of a classified document from the archives (see September 2, 2003). 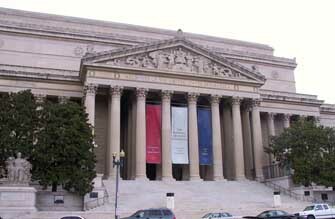 The National Archives building. [Source: Dan Smith]Sandy Berger, a former national security adviser to Bill Clinton, steals a document he believes could be used against him and the Clinton administration from the National Archives. Berger is at the archives to prepare for an interview with the 9/11 Commission, but had previously visited them to prepare for discussions with the 9/11 Congressional Inquiry (see May 30, 2002) and had improperly removed classified notes he had made on the documents (see July 18, 2003). The document he takes is an after-action report drafted by counterterrorism “tsar” Richard Clarke following a period around the millennium when the administration thought al-Qaeda might attack US interests. The report included 29 recommendations for government counterterrrorism programs, several of which were not implemented before Clinton left office. Although Berger thinks the Clinton administration took counterterrorism very seriously, he believes the document could be used against him. One of the workers at the archives sees Berger behaving suspiciously with the documents in a corridor, and alerts a superior. However, the documents are not cataloged, and the archives do not know what documents, if any, have been taken. [Shenon, 2008, pp. 7-8] Berger will be caught taking a document the next time he comes to the archives (see October 2, 2003). Members of staff at the National Archives find that Sandy Berger, a former national security adviser to Bill Clinton, has stolen copies of an after-action report drafted by former counterterrorism “tsar” Richard Clarke from the archives. Their suspicions were aroused on a previous visit by Berger (see September 2, 2003), but before his fourth visit to view 9/11-related documents at the archives, they surreptitiously number the papers he is to be given in pencil, and he initially takes another two copies of the report, which he thinks could be damaging to him. Berger makes frequent trips to the toilet to conceal the stolen papers. During one of the trips, the archives’ staff examines the pile of documents and realizes what he has stolen. They print another copy of the stolen report and hand it to him, saying they think they forgot to give it to him in the first place. He says he needs time alone to make a private call—although a staff member monitors the phones and finds that no call is made from the office phone—and then makes another suspicious trip to the toilet to hide the document. Berger then goes outside the archives for a walk and, worried about taking the stolen papers and notes about other documents he should not have removed back inside the building, he hides them under a trailer on a nearby construction site. He returns to the construction site later that night to retrieve what he has hidden, then destroys three copies of the stolen memo, leaving himself with two copies and his own notes. [Shenon, 2008, pp. 250-252] The archives will confront Berger about the missing documents two days later (see October 4, 2003). Senator Praises Firing - Senator Pat Roberts (R-KS), the chairman of the Senate Intelligence Committee, praises the CIA’s action. However, he is allegedly guilty of a far worse intelligence leak (see April 21, 2006).